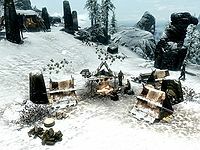 Winterhold Stormcloak Camp is a Stormcloak camp located northeast of Windhelm, close to the White River. Stormcloak soldiers are camped here under the command of Kai Wet-Pommel. They are friendly as long as the player is not in the Imperial Legion. Unlike most military camps, it has no quartermaster. Over the fire a cooking spit can be found, with an anvil next to it. Four small one man tents can be found around the fire, that the soldiers sleep in, if one is not being used the player can sleep in them as well. Next to one of the tents is a wood chopping block and next to another is a grindstone and a workbench. Across from the tents, next to a stone pillar, is a large tent holding wounded soldiers. A small table in there holds a potion of minor healing and a potion of healing, outside the tent is an alchemy lab. Up the hill from there is another large tent, holding a chest, an end table, and a bed roll; this tent is used by Kai Wet-Pommel. Up a slight hill is another large tent holding a map of Skyrim and a dresser. Two corundum ore veins and one gold ore vein are located 500 ft northwest of the camp, high in the mountains. A troll is found nearby, alongside a corpse of a Stormcloak soldier laying on top of the ore. This location is only available if the Imperials control the Winterhold Hold, either if you are allied with them or through Season Unending. This page was last modified on 10 August 2017, at 04:02.